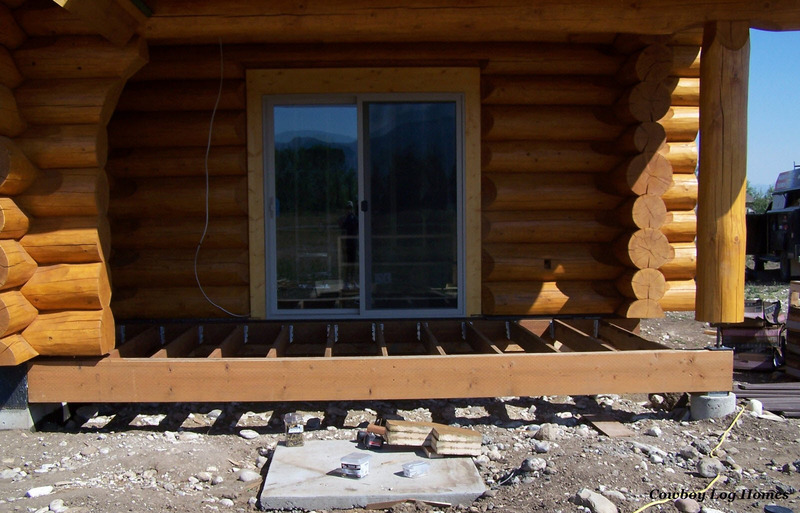 As the exterior work continues the two covered front porches and log railings are still to be installed. 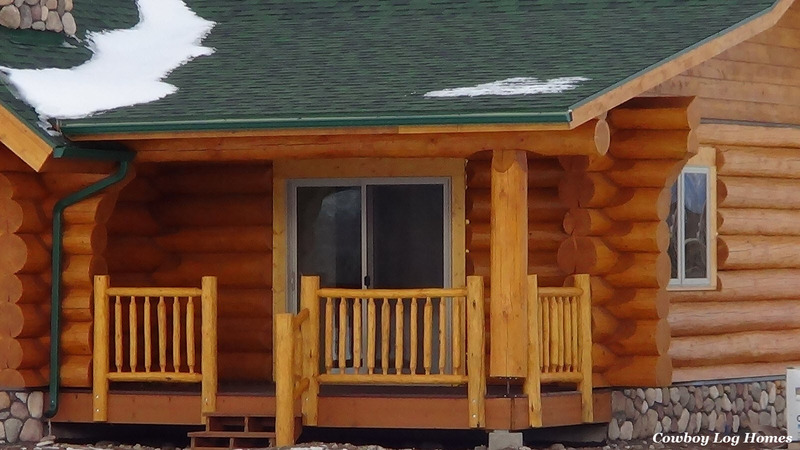 Once the exterior log home staining was completed the porches and railing become a priority. We are now approaching mid September so we plan to get this work done before cold weather sets in. Here we see the carry beam on the joists for the porch is in place. 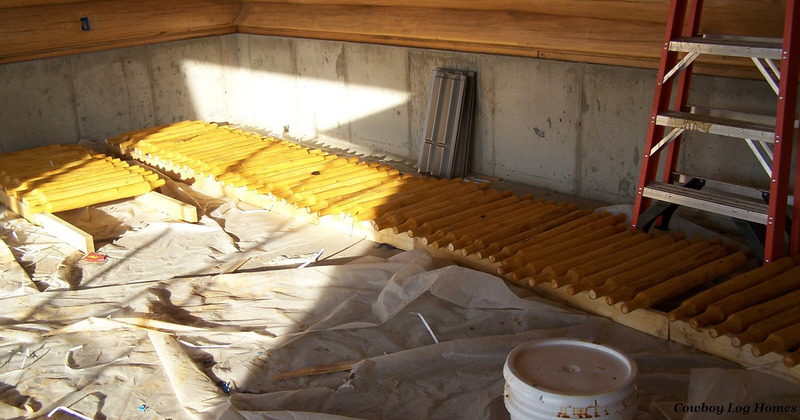 Metal joist hangers hold the treated 2×8’s which are spaced 16 inches on center. . The stair stringers are also visible laying on the cement slab. Once the joists are all in place then the composite decking is installed. The decking cuts just like regular wooden decking, but it is a virtually no maintenance material. Notice how the decking was scribed around the screw jack (located under the log support post). 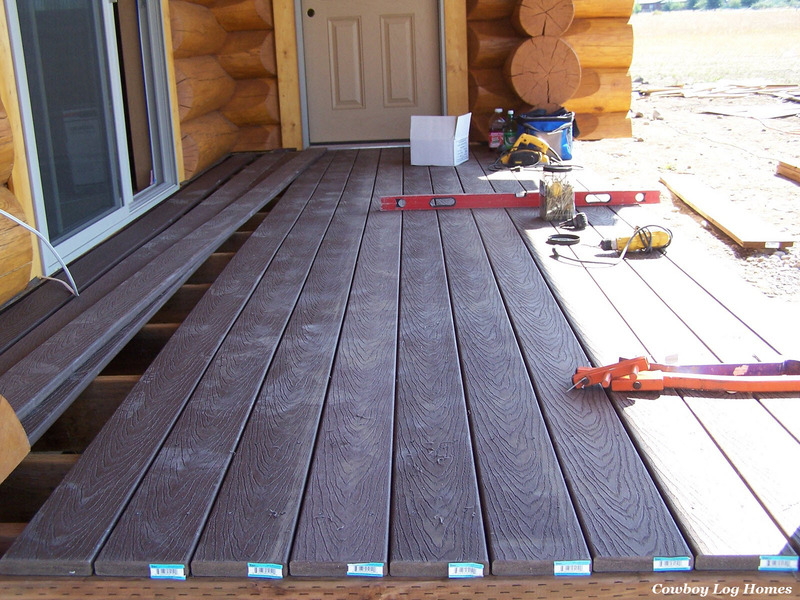 This composite decking comes with a dark brown color and wood grain texture. A small space is left between each of the decking boards. The next step to finishing the decks is the log railing. 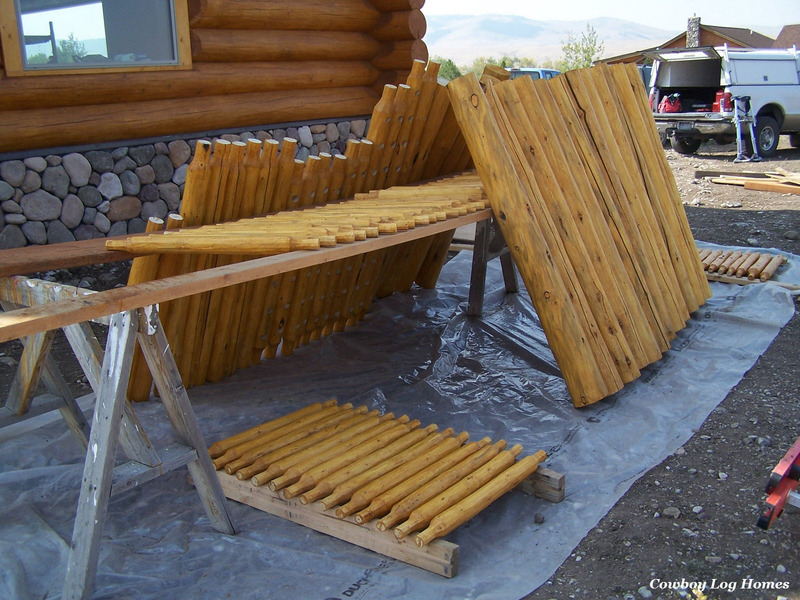 To match the handcrafted log home the owners chose a handcrafted log railing. Each spindle, post, and rail is hand peeled with the draw knife pattern. While the area needing railing looks minimal there were still some 70 spindles needed for the porches. We can see a large number of the spindles laid out in the garage to dry. Outside, more spindles, posts, and top and bottom rails are stained and drying. When installing log railing the posts and mounted first. 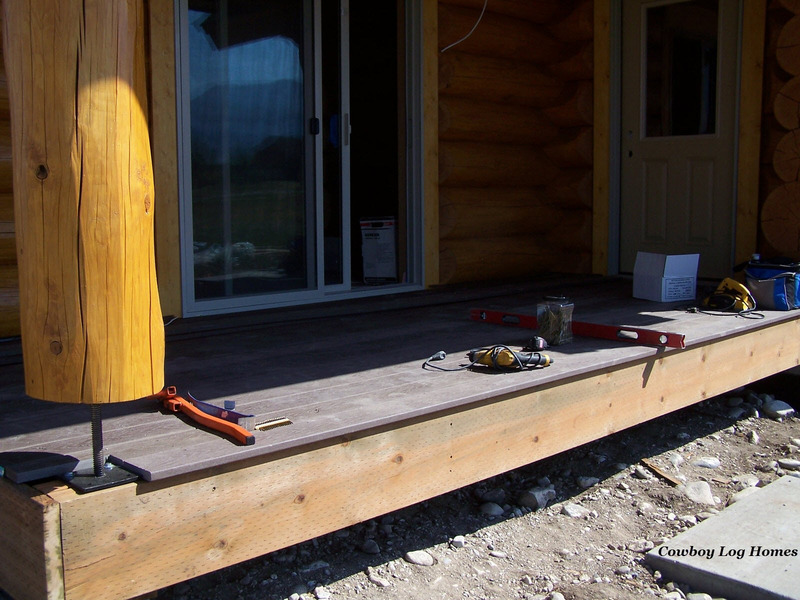 The log posts have to be notched and scribed around the decking. After the posts are bolted into place then the railing along the porch edge is assembled and installed. The railing for the steps is installed last. 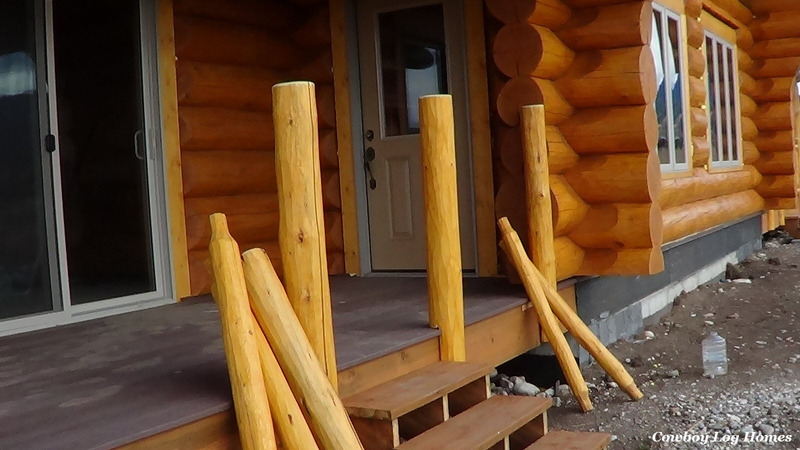 While only two or three steps total the handcrafted log railing gives this log home a very finished look. 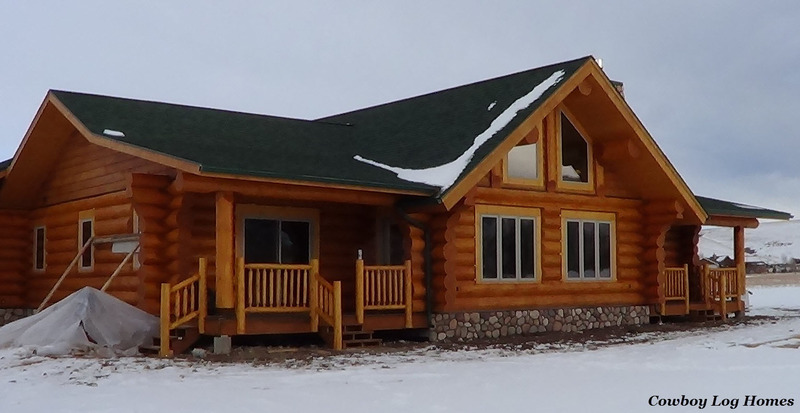 Details, log homes are all about details. Stone work around the exposed foundation and railing may seem like small ingredients, but they have a huge impact on the finished appearance.